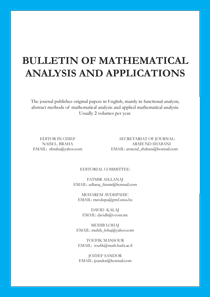 The journal publishes original papers in English, mainly in functional analysis, abstract methods of mathematical analysis and applied mathematical analysis. Usually 2 volumes per year. Authors are invited to submit articles for publication. The manuscript must be original and written in English, and can be submitted to secretariat of the Journal or Editor's who are closely related to the subject of the manuscript.